PRESS RELEASE: Avid® (NASDAQ: AVID) today announced the release of Sibelius 7, the newest version of the company's flagship musical notation software. Combining a deep, sophisticated feature set with an all new task-orientated user interface -- putting all of the software's features at the user's fingertips -- Sibelius® 7 enhances music writing through intuitive and flexible workflows and improved tools for increased collaboration. Compete with a newly recorded professional-quality sampled sound library, native 64-bit performance, full MusicXML interchange support, and advanced typography and grahics features, Sibelius 7 is more powerful and versatile than ever before.
" Whether you're a composer, arranger, copyist, publisher, instrumentalist, teacher or student, Sibelius 7 enables you to write even more quickly and easily -- no matter your level of experience," said Chris Gahagan, Avid Senior Vice President of Products and Solutions. "Sibe lius 7 offers a completely redesigned user interface and technology architecture, providing incredibly fast performance and improved workflows designed to help you create beautiful scores faster and more easily than ever." What's New in Sibelius 7? New and exclusive professional-quality sound library - Unique to Sibelius, the new professional-quality sound library delivers stunning musical realism to scores during playback. It includes the Avid Orchestra, a specially recorded full symphony orchestra, a collection of rock and pop sounds from the Avid virtual instrument team, a 27-stop church organ from leading virtual organ creator Hauptwerk, and a selection of sounds from Sample Logic Rumble and Fanfare featuring 14-time world champion Drum an d Bugle Corps, The Blue Devils. Completely redesigned task-oriented user interface - Optmised for single-display systems, the new user interface employs a rich graphical toolbar and dockable panels that don't obscure the working area, putting all of the software's features at the user's fingertips. The redesigned mixer also allows finer control of playba ck than ever before, delivering more balanced mixes. Full MusicXML interchange - Complete MusicXML import and now export makes sharing files with hundreds of music applications, including Finale®, easier than ever. 64-bit performance - Sibelius 7 is the world's first native 64-bit notation software, and has been completely rewritten to take advantage of the performance of today's incredibly fast 64-bit hardware and operating systems. Powerful text, graphic and sharing options - Publisher-quality typography and graphics import/export capability delivers finished scores with professional-quality text and graphics. Publish and export demanding layouts and text-heavy scores with advanced finishing options, including direct PDF and EPS export. Als o sync with or import notation from Pro Tools®, or export scores as Scorch® files, then share or publish them on the web or via Avid Scorch for iPad®. "Sibelius 7 clearly demonstrates that the design team is not content to rest on their laurels," declares Bill Holab, engraver and winner of 57 Paul Revere awards for graphic excellence in music. "They have completely revamped the interface, made it easier for novice users, yet retained all of the familiar shortcuts. On top of that, they have redesigned the display system so that we get a far more accurate view of the music onscreen, and added in extensive text features that are essential to some of the complex projects we work on, like opera vocal scores. Sibelius 7 is an intrinsic part of our production workflow and will continue to be the main tool we use to prepare high-end music publications and performance materials." 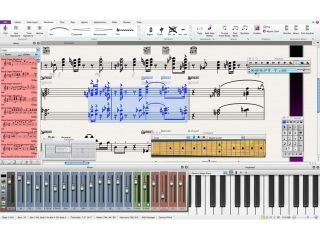 "The striking thing about Sibelius 7 is the new user interface - the startling thing about Sibelius 7 is how much faster the new user interface allows you to work," explains John Murdoch, music director of Lehigh Valley Presbyterian Church in Allentown, PA. "Are you arranging a score for a choral performance? Sibelius 7 makes you faster. Are you creating music for live playback with virtual instruments? Sibelius 7 makes you faster. Are you simplifying a score for Broadway musical auditions? Sibelius 7 makes you faster. And that was just my day yesterday." Sibelius 7 is now available for £459 GBP / €549 EUR. Current Sibelius customers may take advantage of upgrade options of £119 GBP / €140 EUR, with multi-seat upgrade pricing from £47 GBP / €60 EUR per seat. Customers looking to crossgrade from another notation product can purchase a crossgrade for £149 GBP / €170 EUR. Avid also offers individual educator and student pricing for £219 GBP / €249 EUR. In addition, students receive four years of complimentary upgrades. This price and four years of complimentary upgrades also apply to Avid's leading audio and video software, Pro Tools and Media Composer.&nbs p; Educational multi-user pricing is offered at £95 GBP / €95 EUR per seat. To learn more or to watch a video overview of Sibelius 7, visit Sibelius online. For purchasing inquiries, please visit the Sibelius Store.